a) u* stand for natural rate of unemployment. b) πe stand for expected rate of inflation. c) εs whether there are any present supply shocks affecting inflation. a) u0 the stage of unemployment when the real interest rate r is at what the central bank thinks of as its long-run average rate. b) π’, the central bank’s target stage of inflation. 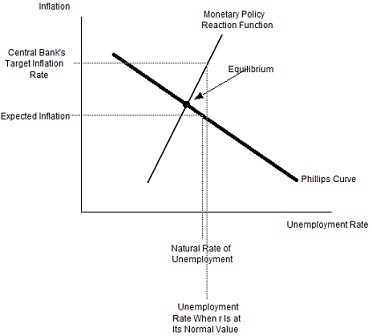 All five of these factors together, in conjunction with the parameters Φ and β--the slopes of the monetary policy reaction function and of the Phillips curve—determine the economy’s equilibrium inflation as well as unemployment rates.